Interstate Fire Protection is pleased to announce our inclusion into the distribution network of Denlar Range Hoods and Fire Suppression Systems. Functioning in the same manner as commercial grade kitchen wet chemical fire suppression systems and ETL tested to UL300A and UL- 507 Standards, Denlar Fire Suppression Range Hoods fill a niche for customers requiring a kitchen hood and/or suppression system for residential cooking in high risk or institutional settings where non-commercial cooking appliances are used. This wet chemical system operates on the same premise as the larger kitchen suppression systems employing automatic heat detection, manual release and electric or gas fuel shutoff. 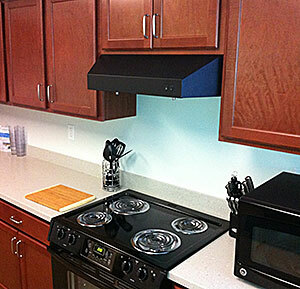 Examples of where Denlar Fire Suppression Range Hoods have filled the need but at a fraction of the combined cost of a commercial grade ventilation hood and suppression system are in Assisted Living Homes, Churches, Public Housing, Dormitories, Daycare Facilities, Municipal Buildings and Public School Classrooms. And using stainless steel construction, these hoods are easily maintained and aesthetically pleasing. Interested? Learn more by calling Interstate Fire Protection or you can contact us via e-mail.